Well, I survived. A great time was had by all, and my legs still hurt more than I could have imagined. But that’s what 4-5 hours of competing on horseback will do. We were divided into teams, but the ropers (a specialty skill) served double, and sometimes triple duty on different teams. In the end, there were no trophy buckles or saddles, which is fine. 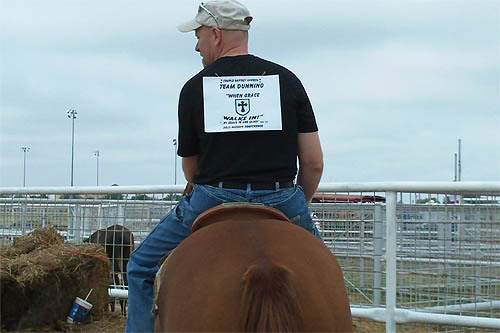 We had the chance to spend the day on horses, encouraging one another in our efforts. I had my first opportunity to ride a horse out of a roping box, which made me realize how much of a specialty skill calf/steer roping really is. 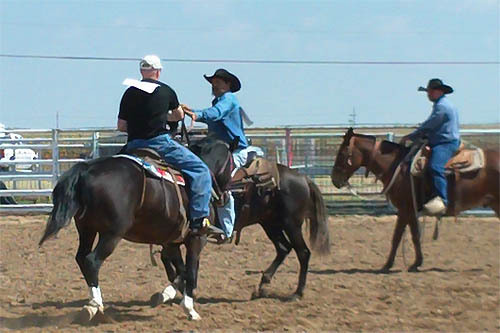 There’s a lot involved in guiding the horse with one hand and trying to rope with the other. I appreciate those who made their horses available to those of us who don’t have horses. I especially appreciate Mr. Smith who let me ride Tonka most of the day. 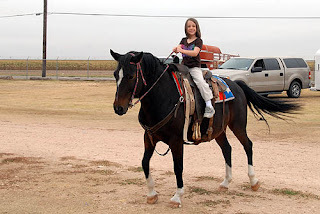 I tried to ride the sorrel horse in the photo at the top, but couldn’t reign him in a way that worked for either of us. So, I switched to Tonka (more affectionately known as “Chubs”) and had a great day. Love this! Grace looks so cute on the horse.